This is not a thread for deals. It is for watches and related products that have recently been introduced or will be in the near future. It doesn't matter whether it's a huge luxury brand like Rolex or a microbrand coming out with it's first watch. Feel free to post pre-orders here as well. If you feel the new release is also a bargain or a deal, feel free to post it here and in the deals thread. Kickstarter or Indiegogo watches can be posted here in addition to the crowdfunded subforum. Basically just post about any new or upcoming release that you are excited about or you think others might be excited about. Please try to include some basic information about the new watch. That might include the brand and model, dimensions, specifications, price, release date, links to the brand website, articles, Instagram, press releases, and of course photos. And of course feel free to add to, clarify, ask questions, and comment on other members' posts. I'd love to have one thread to come to to post about and learn about new watches. Thanks! Re: 2019 New and Upcoming Releases! I was browsing Gear Patrol a couple days ago and came across an upcoming release from one of my favorite brands, Hamilton. They are coming out with a couple new iterations of the latest Khaki Field Mechanical. I'll link to the article below but here is some basic info. I already own the brown/tropical colorway so I doubt I'll be picking one up....unless I come across a killer deal of course. Pretty handy to have all releases in 1 thread. I remember the Chris Ward magazine mentioned that they were going to release a pepsi diver this year. 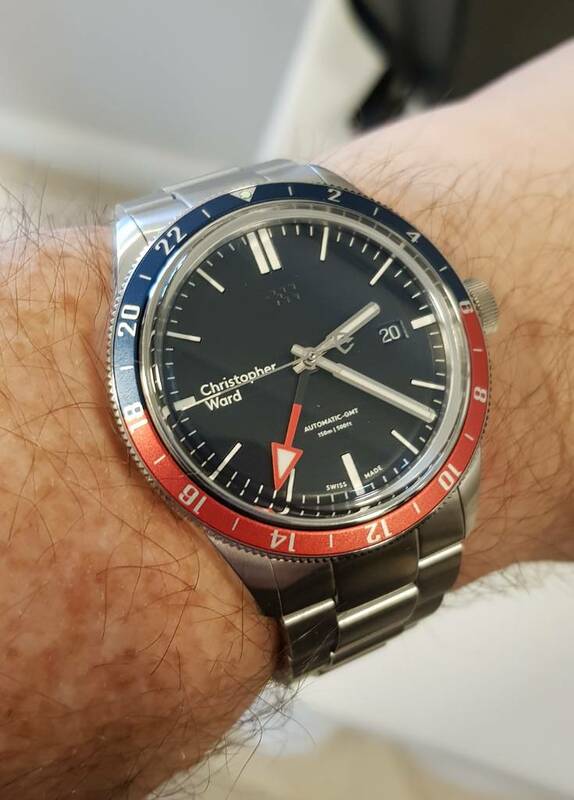 Basically a GMT Master ii homage. Can't find anything about it online at the moment though. Yes. I believe it's the Trident. Someone on the CWL forum posted a screen shot from the magazine, I think, that showed part of it. Hamilton at close to a grand anyone? The Tissot Gentleman Automatic, not to be confused with the Gentleman Swissmatic. I found two very recent articles about this one. Love the crosshair dial! Tissot, as usual, looks to be providing a lot of value with this one. Not bad, right? Whaddya think? BEZEL: Ceramic (matte finish), engraved and fully lumed (Swiss Super-LumiNova BGW9, pip in C3). DIAL: Sandwich construction with Swiss Super-LumiNova BGW9 lume; fully brushed hands with Super-LumiNova C3 lume. Deposit of $300.00 for the Moana Pacific Waterman Bronze is required to confirm order. We will be in contact with you again when the balance of $360.00 USD plus $35.00 shipping is due (June 30th, 2019). I wish Topper had used the SBDC051 instead. That is a beauty and they're putting a lot into the watch with the silicon balance spring and actual 18kt gold for what they're charging. But I don't see many considering spending over $1k on a Tissot. I have a feeling this is going to be their VW Phaeton. Really with Magrette made a 40mm or below watch. I really dig their style, but they are all so big.